The colorway was originally featured on a low-top released in 1999 and has never been retroed. On Instagram, Mache tags his work #CustomsThatLookLike Samples. 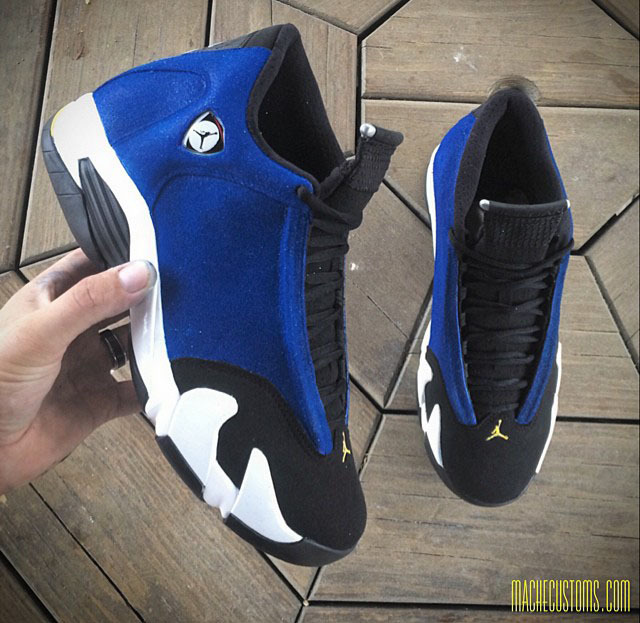 That tag especially rings true with his latest unveiling, a mid-top version of the 'Laney' Air Jordan 14. Mache carried over the royal blue suede upper, black toe cap, white midsole and yellow accents. The colorway was originally featured on a low-top released in 1999 and has never been retroed. If Jordan Brand were to ever bring the 'Laney' 14 back, would you prefer the original low or Mache's mid? Let us know what you think and make your own custom inquiries at machecustoms.com.